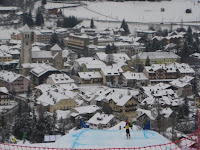 San Candido/Innichen World Cups, Italy and Frostbite! 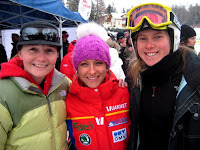 We have just finished the first two world cups for the season. 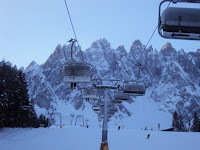 The races were held in San Candido/Innichen in Italy, Sud Tirol, just near the Austrian border. We travelled across from Lienz Austria after a few good days of training up at Molltall Glacier. Many thanks to Jonathan and Fletcher for sponsoring me and making me a personalised race suit for the season :) Much appreciated! We arrived to freezing temperatures between -18 and -23 celcius. The trainig went quite well and it just felt good to be back in a course and on the circuit again!! I was pretty nervous! Natalie came as a representative from TASS to support me, which was very much appreciated. The first race I took a very round line, probably covering the most distance of any athlete…not fast! I qualified 41st and missed out on the finals by about 0.8. The 1st event was won by Anna Holmlund from Sweden. After watching girls and then all the men in the freezing temperatures (-23) I came inside to find that my big toes had turned black and I had frosbite. The beauty of it was,I could not feel it! I had always thought frost bite was somewhat fictional...hmm apparently it is pretty dangerous though…so I went to the doctor as advised as it swelled up and was kind of a dark grey colour. They said I couldn't race the following day in the 2nd world cup and that they needed to put a hole in my toe, I wasn't having a bar of that, so I told them I would come back for the hole after my competition was finished. So I left the hospital and planned on returning the following day. So I was determined to take a straighter line in the 2nd World Cup. I skied better but missed qualification by 0.37 finishing in 39th. The strength of the field has really increased, everyone has been working hard and although I didn't qualify, which I was disappointed about, the result was not bad, however, I know I can do better! Anna Holmlund went on to win this event as well. So I returned to the hospital after the event, as promised, now the doctor told me she needed to put a hole in the end of my toe, so a different doctor came in and had a look, said lie back and I just assumed he was going to put the hole in it... I looked down and he had removed the end of my toe with a pair of scissors!!!!!!! Not an exaggeration! It was now red, flat, raw and it hurt! Great! The good thing about the frost bite was it was frozen, dead and I couldn't feel it, now it was really painful, red and open! So I have at least 5 days off snow, but potentially more as the end of my toe is soft and hurting, I don't think it is ready to be pushed into a ski boot! Off to Munich for the night before flying to Granada for 10 days in Spain, spending Christmas with Chio and her family and ideally doing some training up at Sierra Nevada, I will see how I go with the toe!! Merry Xmas! We are now near Lienz in Austria. Remy and I travelled across from France, stopping to see Marty in Liechtenstein and stopping in Innsbruck for the night. We had a meeting with the Kneissl team in Innsbruck in the morning and headed to the factory in Kufstein in the afternoon. Thanks to Dieter, Nick, Florian and Max for everything, your support is very much appreciated! We arrived in Lienz to some difficult weather and met back up with the New Zealand team. The glacier had high winds, fog and no visitbility, we were concerned, but luckily they towed us to the start with a Groomer and we were able to atleast achieve some good start training. We freeskied in Silian the following day, testing all the new skis, and then finally did speed testing of all the skis at a little T-bar in the middle of no where! (Bloody freezing!!!!!) The good news is the Kneissl's are still the fastest!!! Yesterday we had a great day up at Molltaller Glacier with perfect weather. It was great to get into a course again, some good features and get some feeling back. It was a great day! We are hoping to get a couple of good days training up there before heading to San Candido/Innichen, Italy on Friday, fingers crossed the weather holds up. I will attach a few photos below, including some from recovery sessions in the river nearby! I guess next update will be from the first World Cup, getting pretty excited now, it has come around fast! I have been fortunate enough to receive a TASS 2012 scholarship from TASS (Talented Athlete Scholarship Scheme) which has allowed me to change the way I have been doing things and really focus on this season. Training until now has been going very well off snow, working under the guidance of strength and conditioning coach Michael Chiovitti. We have seen great strength and power gains and am hoping to really see a difference on snow. I spent a couple of days in LA catching up with the Bennett family which is always a hoot! Then onward to Heathrow and down to Fareham to catch up with relatives and meet up with the representatives from TASS before driving across the channel to France. After a long drive I finally arrived at destination... Peissey-Nacroix, France. I brought the snow with me, that's for sure! It hasn't stopped! After a day of rest, we hit the slopes today at Tignes and it was great to get back on my skis. Loads of fresh snow and I felt strong on my feet. It looks like the first events in Grasgehren, Germany have been cancelled so I guess the first event will be the world cups in San Candido Italy on the 21st and 22nd December. So far so good! Be in touch soon!